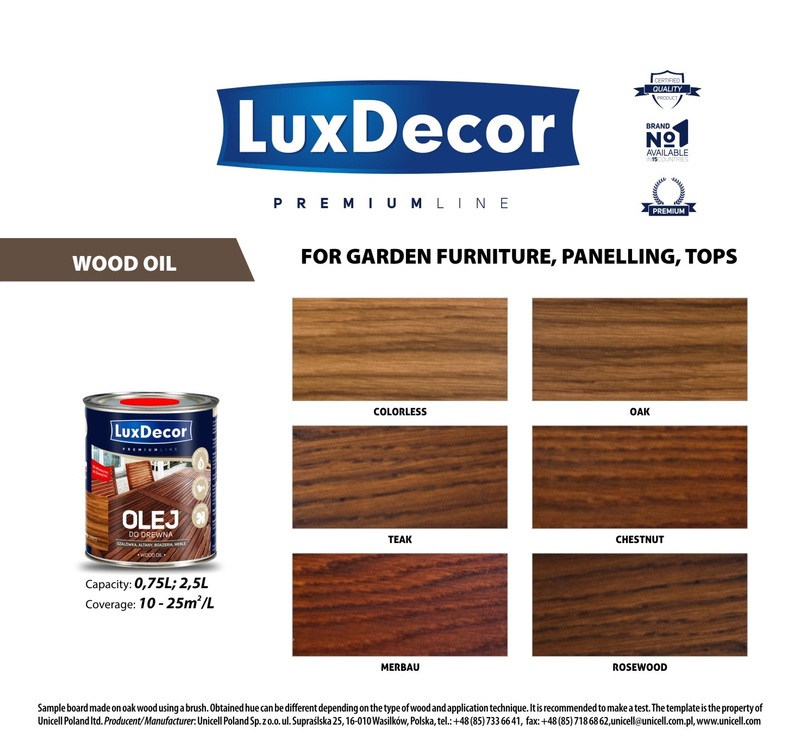 Luxdecor Premium wood oil is used to impregnate and decorate all types of wood both indoor and outdoor. It brings out and highlights the natural beauty of wood. It prevents wood drying and cracking. It does not flake off. The oil also protects the wood from weather conditions, such as moisture or UV radiation. Substrate preparation: The wood should be clean and dry. 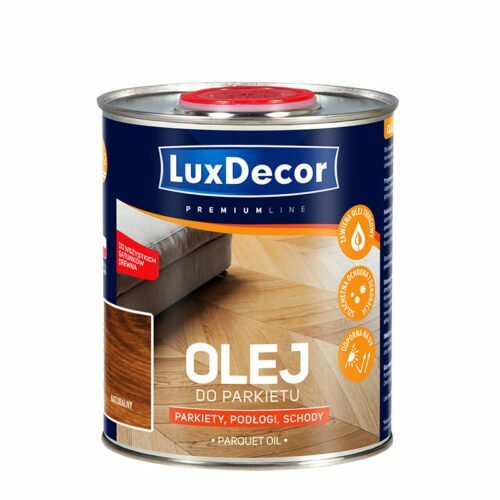 In the case of bare wood – polish with abrasive paper and dust off. In the case of varnished or waxed wood – sand down to expose bare wood and dust off. Surfaces exposed to insects, fungi and mould must be protected using a biocide agent. 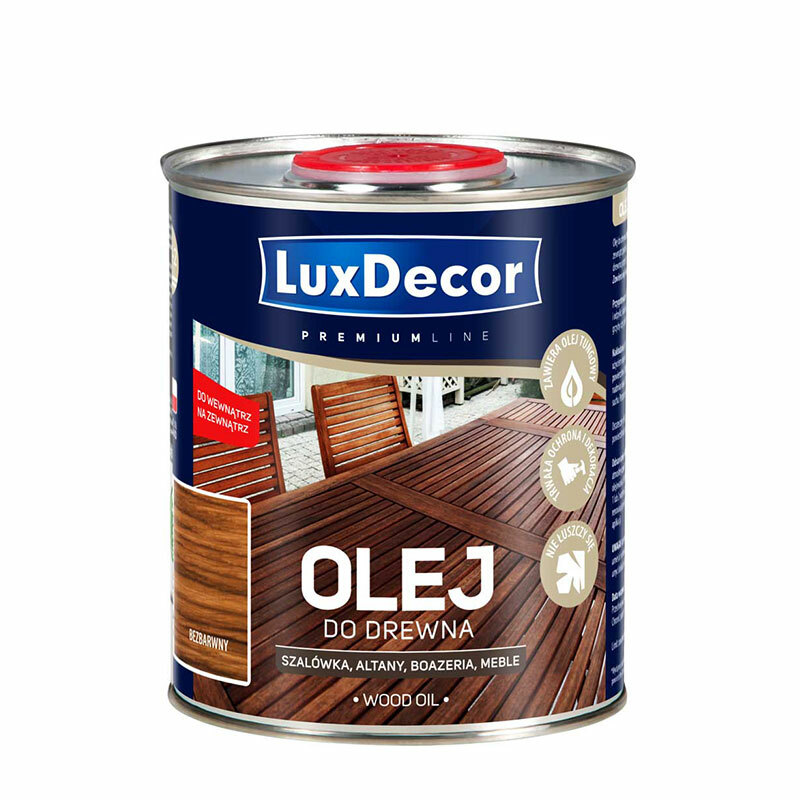 Application: Perform oiling when wood moisture is below 20% and air humidity below 80%. Stir well before use. Repeat stirring from time to time to ensure even colouring of the surface. Apply generously with a brush or cloth and rub the oil along wood grains. After 30 minutes, collect excess oil with a cloth. Leave for 12 hours and reapply in the same manner. Ultimately, the oil should be rubbed until dry. Leave for at least 24 hours until completely dry. Reapplication: Oiling should be repeated twice a year. Frequency of maintenance and renovation depends on weather conditions and traffic intensity. Spots exposed to intense use may require more frequent treatment. Discolouration or white spots mean that application of 1 or 2 two layers on damaged parts is necessary, depending on the needs. After oil application, the surface should be uniform and matt. For complete renovation, polish the surface with abrasive paper, dust it off and then follow the procedure for the first application. Notea: Final effect depends on the level of wood polishing, wood type and method of application. Use products from a single production batch for painting larger surfaces, or pour contents of containers from various batches into one container and mix well. Storage: Store at temperatures between 5 and 25°C in a tightly closed original container. Protect from freezing. Expiry date stated on the package.